Combine centuries-old culinary traditions with a diverse city home to people of many different nationalities and you can’t help but get a fabulous food scene. London is a fantastic destination for foodies, and here’s what you need to eat when you’re there. Bacon roll: Start your day in Spitalfields, in the East End, with the quintessential British breakfast. A bacon butty is a thick slab of back bacon smeared with tangy HP sauce and sandwiched between a roll or two slices of buttered bread. Curry: Head to Brick Lane for a plate of one of England’s favorite dishes: curry. The heart of the city’s Bangladeshi community, Brick Lane is home to numerous curry houses. While you are there, save some room for a salt beef bagel from one of Britain’s most famous bagel shops, Brick Lane Beigel Bake. Cheese: Make your way to the posh Mayfair neighborhood to find London’s oldest cheese shop, where you can sample many varieties of cheese from around the country. 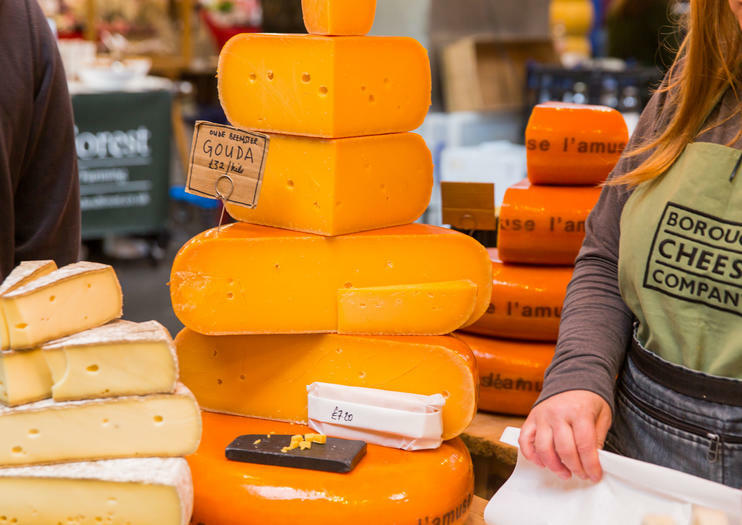 Another great spot for cheese sampling is Borough Market, with dozens of vendors and countless delicious products. Scones: Indulging in a traditional English cream tea, featuring scones smothered in clotted cream and pots of fragrant tea, is a must-do in London. Make like the ladies who lunch by heading for one of central London’s posh department stores, such as Liberty of Fortnum and Mason, for this quintessentially British experience. Fish ‘n’ chips: Don’t miss out on the chance to eat Britain’s national food while visiting the capital. Stop into a traditional pub near Charing Cross or London Bridge and tuck into a plate of crispy battered cod and thick, perfectly cooked chips—and wash it all down with a pint of real ale.